Pesticide dose is a parameter that is central to pesticide efficacy, effects of pesticides on non-target organisms, evolution of pesticide resistance, and non-intended pesticide effects such as hormesis (the stimulatory effect of a sub-toxic dose of a toxin). This book details and documents the reasons why only a tiny fraction of applied pesticides reach their desired molecular targets in the pests for which they are intended. This is followed by a discussion of the relationship of dose to efficacy levels and the practical implications of this. Pesticide movement to non-target organisms by drift and other processes has become a topic of great interest and is thoroughly covered. The book ends with a review of the effects of herbicides on non-target terrestrial plants with large differences in sensitivities to low herbicides doses. 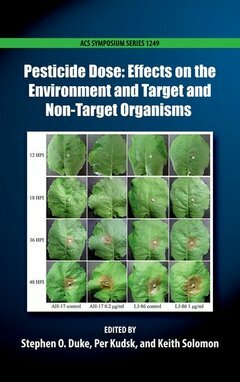 This volume gives the reader an appreciation for the complexity of pesticide dose effects. Stephen Duke (Ph.D, Duke University) is Research Leader of the USDA, ARS Natural Products Utilization Unit in Oxford, MS, U.S.A., where he is involved in discovery of natural products for pest management. He is an expert on mode of action of herbicides. He is a Fellow of ACS and AAAS and former Chair of the Agrochemical Division of ACS. He is Editor-in-Chief of the journal Pest Management Science. He is author or co-author of more than 400 peer-reviewed publications. Per Kudsk is Professor and Head of the Crop Health Section at the Department of Agroecology at Aarhus University in Denmark. He is a weed scientist has been involved in research on integrated weed management, herbicide resistance, allelopathy and non-target plant effects of pesticides. He is currently coordinating the EU project IWMPRAISE with 37 partners from 8 countries. He is former President of the European Weed Research Society. He has contributed to more than 200 scientific publications. Keith Solomon is Professor Emeritus in the School of Environmental Sciences at the University of Guelph. He has taught courses in pesticides and environmental risk assessment and conducted research into fate and effects of pesticides and other substances in the environment, exposure of humans to pesticides and industrial chemicals, and risk assessment. He has contributed to more than 460 scientific publications and reports.